Provide comfort for the family of Frances Dew with a meaningful gesture of sympathy. It is with great sorrow that the family announce the passing of Frances Simone Dew, at the age of 80. 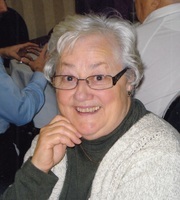 She passed peacefully in her sleep on February 8th, 2019 at Health Sciences North. Cherished wife of Donald Dew (predeceased). Loving mother to John, Chris and Kathy. Beloved Nanny to Christa (Robbie), Grant (Christine), Justin, Brandon, Kielen, Eric, Ricky and Jessica. Dearest daughter of Arthur and Muriel Giroux both predeceased. Adored by her siblings Bud (Marge), Sue (Pieter), both predeceased, and Una (Larry). She will be deeply missed by all her nieces and nephews. Frances taught elementary school in Sudbury for over 30 years. She loved teaching a great deal, and touched the lives of each of the students who entered her classroom. Frances spent much of her retirement at her camp in Ludgate, with both her children and grandchildren. She was always up for a rousing game of Canasta or Crib, or a challenging Scrabble match. She also loved to read – even as her eyesight deteriorated, she continued enriching her mind with audiobooks. In the last several years, she also spent her time playing Bridge with a wonderful group of woman who will miss her very much. The family would like to extend a very special thank you to all of her friends at the Bonic, for all of the love and support they’ve shown her. To the staff at Health Sciences North, a heartfelt thank you for the excellent care she received in her final days. A mass in celebration of her life will be held on Thursday, February 21st, 2019 at 11am in Holy Redeemer Church (1887 Bancroft Drive, Sudbury) followed by a small gathering. In lieu of flowers, donations to the Maison McCulloch Hospice would be greatly appreciated. Arrangements entrusted to Sudbury Park Lawn Cremation Services. To send flowers in memory of Frances Simone Dew (Giroux), please visit our Heartfelt Sympathies Store. Consider providing a gift of comfort for the family of Frances Dew by sending flowers. In loving memory of Aunty Frances. I will always remember her chatting and singing while making our lunch at camp, as we sat reading comics. John, Kathy and Chris, thinking of you all at this time and sending you our love and hugs. Frances's colleagues at RTO/ERO (Retired Teachers of Ontario/Les enseignants(es) retraités de l'Ontario) send their condolences. We know that your best comfort will come from the telling of her life's stories by those who knew the joy of her presence in their lives, including her students and staff members. Frances's name has been added to our In Memoriam. She will be remembered at our next meeting and a donation will be made to the Elgin Street Mission in memory of Frances Dew. Dearest Kathy John and Chris, we are very saddened at the passing of your Mom. We wanted to take this opportunity to tell you how beautiful and real Aunt Fran was. She’s back with Uncle Don and all the pups now. Our sincerest condolences!